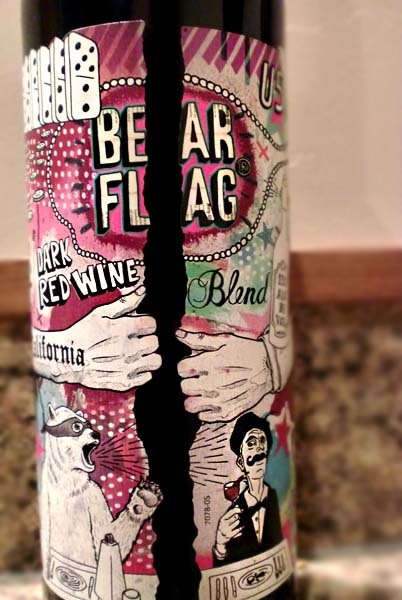 And the award for the craziest wine label goes to... Bear Flag and their Dark Red Wine Blend. Seriously look at that label! There's a crack down the middle where there isn't any label, just the glass bottle. I've never ever seen that before. It's simultaneously cool and crazy. Bear Flag Wine is two young female wine producers out of Modesto, California and apparently they enjoy putting out wine blends since that's all they make. Blends, blends, and more blends. This particular bottle, their Dark Red Wine Blend is a combination of Petite Sirah, Alicante Bouschet, Zinfandel, Petit Verdot, and Tempranillo. Bear Flag's Dark Red Wine Blend pours a deep garnet color and actually has quite subdued aromas of plums and a hint of spice. Tasting brings still more plum, blackberry jam, and a vague earthiness with only mild tannins. I'm actually quite surprised by this wine. The label is awesome and certainly attention grabbing, whereas the wine, itself, is really, really mild. It almost tastes like a simple cheap Malbec despite the fact that there's no Malbec even in it. Tasting this blind, there's no way I would have guessed it was a blend of 5 different varietals. That being said, there's nothing particularly wrong with this wine and it's under $10, but it just doesn't live up to the over-the-topness of the label. So sad. Drink This: if you want to buy a drinkable table wine with a creative label. Don't Drink This: if you're looking for a more interesting red blend.